Summer’s coming for those of us living in the northern hemisphere, and it makes perfect sense then that you would want to hold an outdoor BBQ with your family and friends, feasting on lots of meat and marshmallows while the mosquitoes also come out and have some fun. For those who want to have a less than messy affair (as most BBQs are the polar opposite of that), there is always the Brisbane Tabletop BBQ which is easy to use and convenient. You can fold it up and tote it around just like a culinary briefcase, and is a snap to assemble on a tabletop, on the floor or basically any suitable surface. 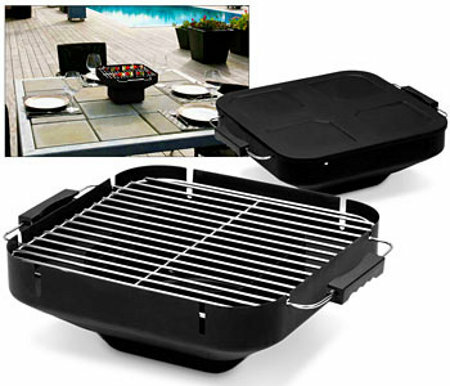 The grill uses durable steel and is fully adjustable, letting you get the right amount of heat each time. IWOOT is carrying the Brisbane Tabletop BBQ for £49.99 – looks set to be a hot (pun intended) summer purchase! Do you have an estimate on how much it actually weighs?